Hollywood, California – July 20, 2009 – Capitol/EMI announces the September 22 U.S. release details for two new Duran Duran collections featuring several rare and previously unreleased recordings and videos. 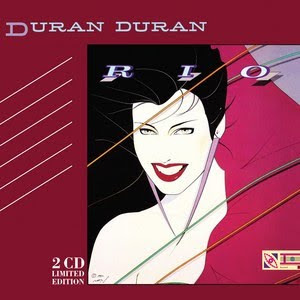 The British pop band’s second album, 1982’s Rio, has been expanded for a deluxe 2CD ‘Special Limited Edition’ to include its original U.K. mix and several tracks remixed for the U.S. album release, as well as a second disc of demos, B-sides, and other rarities. Rio’s new 2CD ‘Special Limited Edition’ will be housed in a deluxe, 52-page case-bound book with canvas cover finish. Released in 1982, Rio was Duran Duran’s second album. Fueled by their groundbreaking, cinematic music videos, leading man looks, and staggeringly heavy rotation on MTV and radio for the album’s singles, including the title track, “Hungry Like The Wolf,” and “Save A Prayer,” Duran Duran shot to superstardom, topping charts around the world. In the U.S., the double-Platinum album spent 129 weeks on Billboard’s Pop Albums chart. Previously unreleased and long sought-after by fans, Duran Duran’s Live At Hammersmith ’82! concert recording will also be released September 22 in CD/DVD and digital audio packages. Live At Hammersmith ’82! has long been sought-after by Duran Duran fans. Previously unreleased, the 1982 concert was filmed and recorded at London’s Hammersmith Odeon as Duran-mania was sweeping the world. The performance features signature hits including “Rio,” “Hungry Like The Wolf,” “Girls On Film,” and “Save A Prayer,” as well as the fan favorite “Make Me Smile (Come Up and See Me),” among others. The set’s DVD includes the full concert, as well as music videos for tracks from the Rio album and two previously unreleased ‘”Top of the Pops” TV performances from 1982. In a career spanning 30 years, Duran Duran has sold more than 100 million records around the world and has achieved 21 Billboard Hot 100 charting singles in the U.S.